Despite a difficult first season with the team, we are finally beginning to see this dominant Chelsea Mourinho spoke of. Southampton managed to draw the league leaders. They had a particularly interesting role for their new signing from Red Bull Salzburg, Mane. Overall, this match-up was very entertaining with some interesting tactical intricacies to boot. An aspect of Chelsea’s play that is immediately visible is that their attacks tend to gravitate towards the left side of the field. This innately provides them with many players near the ball once it is lost, meaning they can counterpress more effectively and win the ball back “very very fast.” Though they are very fluid positionally, Chelsea’s offense is largely focused on utilizing Eden Hazard’s ability to its fullest. So much so that the right-sided winger of Chelsea completely leaves that area of the field. Schurrle (and later Willian) did this in order to provide an extra option for combinations as well as provide penetrating runs towards goal from the weak-side of the opponents. The switches that were played from the left went only to Ivanovic, who had a simple vertical role on the right. A nice addition to the strategy of Jose Mourinho to overload Hazard’s playing area was the addition of Filipe Luis. Luis put in an impressive display, showing his combination competence and ability. Luis read the gaps which would open in the Saint’s defense very well, and had the timing in his runs as well as the technique to help his team exploit the holes. Luis and Costa should be familiar with playing in tight spaces from their days in Atletico, and the experience was very visible. In one particular scene Luis made a diagonal run from the flank and was played through by Cesc before he cutback the ball for a great Diego Costa chance. To combat Southampton’s expected good pressure, Matic and Mikel consistently dropped into the defensive halfspaces in order to provide stability in possession. When one would drop next to the central defenders the other would take up a position in front of the central defenders. This was in order to ensure connection throughout the team. Cesc had a role higher up the field where he tends to struggle due to the tight spaces. He moved in a manner which balanced all of Costa’s movements, which were usually the diagonal runs towards the flanks we are accustomed to seeing from him. He also dropped deep into either defensive halfspace to receive the ball and assist in building the play. When Willian came on later in the game Cesc had an even high role. He was oriented more towards the left flank in order to balance Willian’s long and deep movements inside. Willian likes to drift very far from his right flank to join the central midfielders and add his dynamic abilities to the build up phase. Usually it is Oscar who balances these movements, and it is a role which fits Oscar particularly well. Cesc struggled though, and later in the game Drogba came on for Mikel which moved Cesc deeper. This immediately made him play better. He played a ridiculous long ball into Drogba’s feet in between two Southampton defenders. Most of Chelsea’s success came when Hazard moved into central areas and received the ball. Be it by his dribbling ability or his skill in combinations, a dangerous scene always had the potential of arising. A couple of times he directly dribbled past Wanyama and through Southampton’s midfield on his own. Hazard cutting inside from the left and dribbling diagonally inside cause problems as well. This meant many Southampton players had to pressure him, leaving space for his teammates to exploit. In one particular scene he played the ball wide to Cesc after being pressured, Cesc then proceeded to play a ball through Southampton’s defense and into the box for Filipe Luis. Chelsea looked even more dangerous when Matic became actively involved in the attack down the left side. He is an excellent dribbler and passer. He even made some runs which overloaded the left side and caused Southampton big problems in the local scene in regards to the ball position. He also played many vertical passes from deeper areas right into Eden Hazard. Chelsea’s goal stemmed from a vertical ball. Luis played the ball into Costa who was pressed by multiple Southampton defenders. The ball was knocked away only for Cesc to immediately play it into Hazard’s stride, who was taking advantage of the space created by the pressure on Costa. Southampton’s Mane was used in a similar role to Hazard in Chelsea’s goal scene. Overall, Mourinho must be pleased. Though Chelsea had most of the control of the game with their focus on stability in build-up phases, Southampton had quite a successful strategy as well. They focused largely on playing penetrating passes into Pelle. From there Pelle would combine with his on-coming teammates while Mane provided the penetrating power. Mane had some moments where he was the recipient of the penetrating passes and displayed his combinational abilities in those moments as well. Specifically, he had a scene where he “dummied” the pass and let it run through to Pelle before making a run for the return pass. He also had a scene where on his first touch he played a no-look lay-off pass while he was already turning around to make his run through the defense. Mane was largely successful in intense combination play in his time with Salzburg as well. Schneiderlin was the player who provided most of the stability in build-up phases, dropping into either defensive halfspace depending on where the ball was. Though Costa managed to force a large amount of passes back to the keeper and then long balls from the keeper. Similarly to Southampton, Chelsea put a high importance on pressuring the ball and always keep the ball pressure constant – even if the fullbacks had to push high up the field. While Tadic remained slightly wider on the left flank, Davis moved inside quite a lot. This was a strategy to help in combinations as well as to help pressure 2nd balls that were aimed at Pelle. A long pass into Pelle is what resulted in Southampton’s go-ahead goal. Chelsea’s defense collapsed onto him and he laid the ball off to a central midfielder who played the ball over the top to Mane, who was exposing the space left open by Chelsea’s collapsed defense. Both teams played in a 4-4-2/4-4-1-1 defensive shape with a high focus on ball pressure. There was usually adequate amount of defensive access to the ball, though the defensive structure can be greatly improved on either team. Chelsea in particular still have the glaring problem of their central midfielders being very far apart in defense. This is definitely not a great way to support your team’s pressure on the ball. Mane actually took advantage of this poor support when he drifted towards the left flank. He played an escape pass to Wanyama in the center who had an excellent situation ahead of him due to Chelsea’s defense pressuring Mane. Southampton had their problems as well. 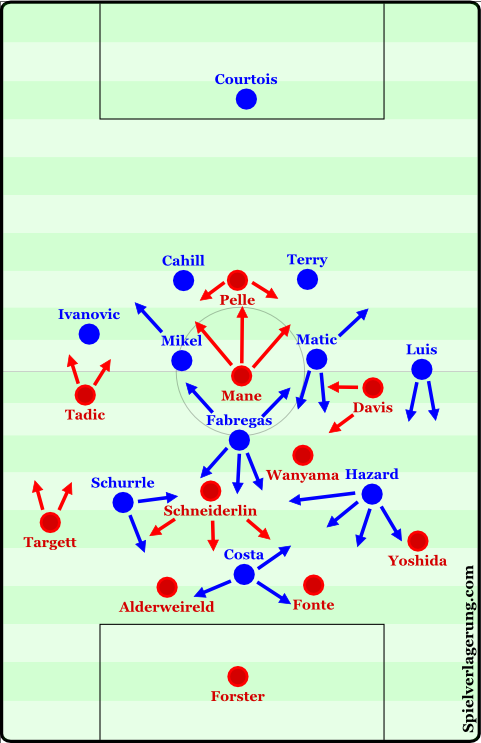 With Pelle not supporting the defensive shape when the team was pushed deeper, Chelsea had an even easier time stabilizing their possession and switching the ball. An interesting side note on this topic is that Chelsea has improved greatly in their positional structure in possession in comparison to their earlier games. Along with their improvements in the line-up and in knowing each other better – they have become possibly a top 3 team in Europe. A great game between two of England’s best teams. Southampton showed some interesting and successful strategical plans which should leave their fans looking for more. 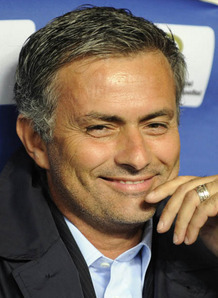 Mourinho’s Chelsea played a great game, especially in the second half – even though they failed to score. Chelsea look like they are improving with every game and are surely an exciting team to be reckoned with in Europe this season. Chelsea remain in 1st place while Southampton remain in the top 4, leaving an interesting rest of the season ahead for fans of the Barclay’s Premier League.